Today was a good day! One of the many deliveries to the office brought us our latest goodie to play with! 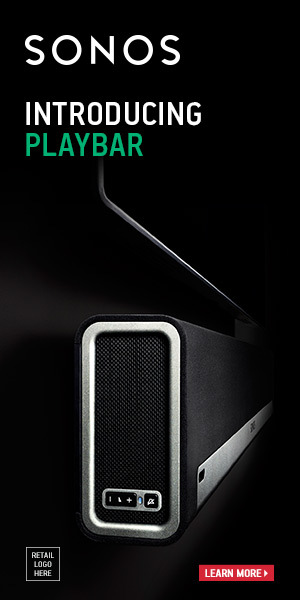 The long awaited SONOS PLAYBAR! Now this didn’t sit in the box very long, before we had to start playing with it. After unpacking the actual SONOS box from it’s shipping box, I started to dig in. Removing the foam safety wrapper, slice open the tape sealing the box shut and open up the black beast! One side note – I notice how similar the packaging on SONOS products resembles the packaging of Apple. Sure, SONOS packaging is black and Apple packaging is white but they both have a insane amount of attention to detail even down to the packaging. The two companies are very similar in many other ways: They both hold the customer experience to be paramount. The build products that look great and work great, while always ensuring that they are easy to use. Does this mean you’re working in an fenced off sandbox, yeah a little… but the customer won’t mind as a rule because the products just work! Plain and simple. That’s why these products keep flying off the shelves. Cause people just love them! So I get this beautiful matte black box open and grab the PLAYBAR to begin unwrapping it from it’s nice white protective sleeve. Now what’s next, to open one of the boxes at the bottom of the package to remove the power cord and the optical cable… and that’s it! Time to get this puppy rocking. I take the PLAYBAR and plug in the power cord and the optical cable. Plug the power cord into the Panamax power bar then insert the optical cable into the optical output on the back of one of our Samsung Plasma. Now that the two cables are plugged in, it’s time to add the PLAYBAR to the system our existing system. I go ahead and open my SONOS app and select ‘Add a Component’ and following the on-screen instructions, pushed the two buttons on the side of the PLAYBAR. Giving it a moment and presto, the bar is now connected and I label it Living Room. I go ahead and follow the rest of the on-screen instructions, mainly saying that there will not be a SUB or a couple of PLAY3’s in the back to provide full surround. Nope, we’re just going bar bones with this demo. So in less then 5 mins from slicing the box open, I’ve got TV audio playing through the PLAYBAR. Another minute or two and my Rogers Cable remote is controlling the audio level of the PLAYBAR too. Now we sell a lot of different soundbars, but I’ve got to tell you, this is the fastest one yet! In less then 6 mins we’ve got it un-boxed and running. And let me tell you, it sounds great! The sound from this PLAYBAR is fantastic. Its clear and powerful like the SONOS sound we’ve come to expect from their smaller products. Now the room I tested this is good size, and let me tell you what, it’s sound field is excellent. This is a product that I would put in my house and love it! You may have noticed that I haven’t said a word about the music side of this product, well you know it. It’s SONOS, it has all the music! What really impresses me about this product is the fact that we can finally supply a product that will achieve what I have always considered unattainable — Yup I’m talking about wireless surround sound. It has finally arrived! You see, we can take one of these beautiful PLAYBARs and match it with a SUB and two PLAY3 speakers to have complete surround sound system that will absolutely destroy and HTIAB system and even alot of small bookshelf surround sound systems. This is the perfect system for those existing open concept rooms and temporary locations. Long and short, if you have a naked TV (a TV without a speaker system) you NEED this PLAYBAR in your house. If you’ve already got some SONOS products, you need to add this one too. Trust me, you won’t regret it! Contact us today to order yous! I love our playbar. Need to pair it to a Sonos sub though to complete the room. you’ll like the SUB! it’s a beast! It has a very strong tone. Then if you add in 2 play3’s you’ll have a complete surround setup. Baby steps. The new born is going to take priority very soon. An expensive surround sound but a great sound indeed.